Solvej is a New Zealand company that makes sustainable and attractive swings that are packed with features. The company offers a slew of swing choices including baby and toddler swings, child swings and even swings for little ones with special needs. Bonus, Solvej is committed to making sustainable choices when possible. The standard Solvej swings are made with 100% acrylic canvas because it is rot proof and is the best outdoor furniture canvas on the market. In fact this canvas has a 5-year manufacturer’s warranty from fading. The Solvej Organic swing is made from 100% organic hemp canvas, which is awesome, though not as rot resistant, so Solvej suggests not leaving the organic swing outside for extended periods. Solvej chooses wood that not only meets the criteria of being naturally weather durable, but it also must come from a planted or sustainable source. That said, Solvej swings are made with salvaged timber from Matai (Prumnopitys taxifolia), a native and endemic tree to New Zealand. The non-toxic acrylic water bound paints and lacquer used on the swings are sweat and saliva resistant. Keep reading to learn more about this cool swing company. Each of Solvej’s swings are conveniently designed to pack down flat for easy storage and transport, while carbine hooks and screw eyes make the swing easy to move between indoors and outdoors or various places in your home or other locations. Solvej doesn’t just sell swings. They also offer many tips on their site about how to keep your swing safe and looking fabulous for years and years. They promote regular cleaning to keep the swing fabric looking good and give advice such as how you can brush and hose the canvas regularly to remove dust and other solid particles, plus tips on how to get rid of stains. They also advise that you oil the wooden parts of the swing often with any non toxic outdoor oil to prevent early graying of the wood. 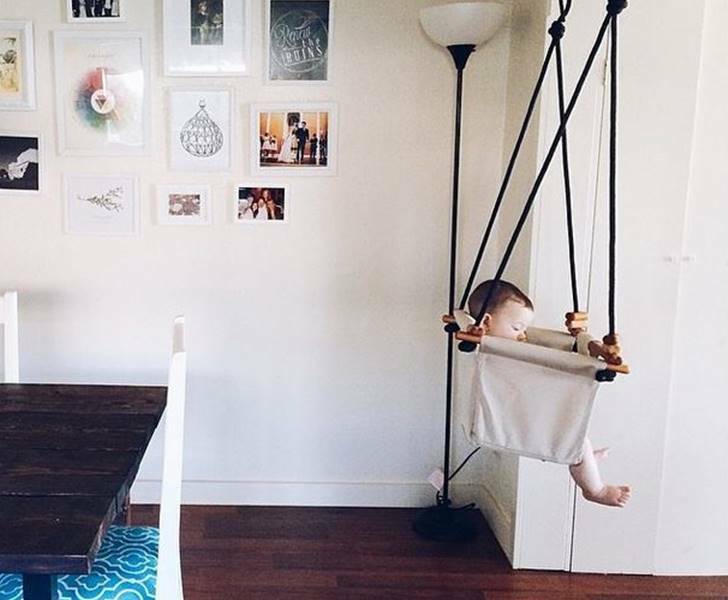 Solvej even offers an entire page devoted to how to build your own DIY swing stand and the benefits of swinging for your baby such as eye coordination, balance development, and of course fun. Bonus, a standard 9 year guarantee on most of their products, makes a Solvej swing a great investment for you and your child. Solvej is a New Zealand company that makes sustainable and attractive swings that are packed with features. 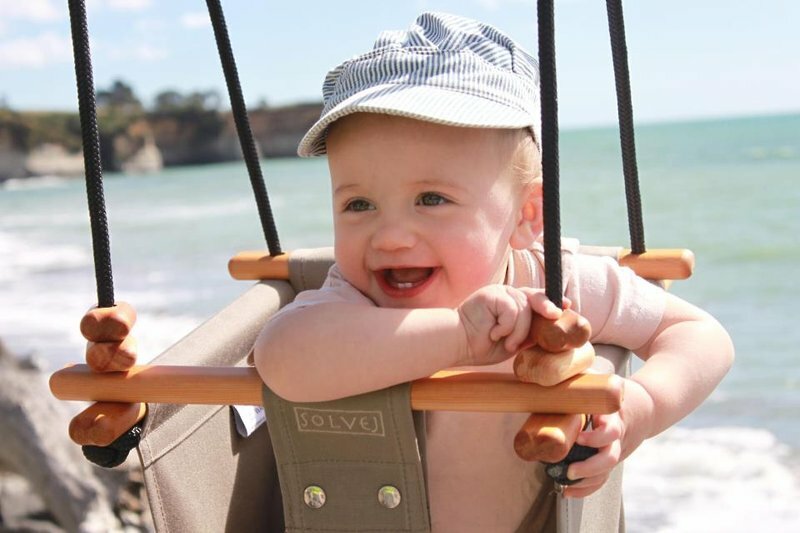 The company offers a slew of swing choices including baby and toddler swings, child swings and even swings for little ones with special needs. Bonus, Solvej is committed to making sustainable choices when possible. The standard Solvej swings are made with 100% acrylic canvas because it is rot proof and is the best outdoor furniture canvas on the market. In fact this canvas has a 5-year manufacturer's warranty from fading. The Solvej Organic swing is made from 100% organic hemp canvas, which is awesome, though not as rot resistant, so Solvej suggests not leaving the organic swing outside for extended periods. Solvej chooses wood that not only meets the criteria of being naturally weather durable, but it also must come from a planted or sustainable source. That said, Solvej swings are made with salvaged timber from Matai (Prumnopitys taxifolia), a native and endemic tree to New Zealand. The non-toxic acrylic water bound paints and�lacquer used on the swings�are�sweat and saliva resistant. Keep reading to learn more about this cool swing company.